Aaron Clarke finished seventh in his Superstock 600 race at Knockhill over the weekend. 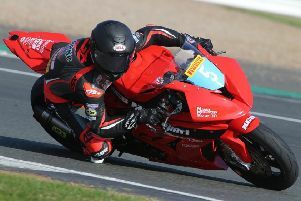 Draper Racing riders Clarke and Tommy Philp travelled north of the border for race action at the weekend. Kirton rider Clarke began the 22-lap Superstock 600 race from the third row of the grid and got away to a really good start to move up into sixth place on the first lap. Two laps later he was up to fifth. The race was slowed when the course car came onto the track to enable the marshals to retrieve a crashed bike and rider on lap seven. It was not until lap 10 that the car left the circuit to allow the race to continue. Clarke retained fifth place and, although he was in close company with a group of riders just behind him, he held his position until the final lap when Milo Ward and Aaron Clifford finally got the better of him and passed him on the run to the flag. Clarke followed them across the finish line just half a second adrift to seal seventh place and pick up nine championship points. He now holds joint fifth place in the overall standings on 59 points. East Kirkby’s Philp qualified in 18th place for the 18-lap British Supersport Sprint race on Saturday, but didn’t get the best of starts and was holding 17th place on the first lap. He was embroiled in a battle for position with a group of four riders and on lap six he passed Danny Booth to move up into 15th position. But on lap 10 Booth fought back and passed him again leaving Philp to bring the Draper Racing Yamaha home in 16th place. But a rider ahead was in another class and Philp was elevated up to 15th to earn another championship point. Starting the 26-lap Feature race on Sunday from a sixth-row grid position it was always going to be difficult to make much headway as the Knockhill course is very tight and twisty with not much room for overtaking. But Philp made good progress and fought his way up to 18th place overall - 16th in his class, sadly just one place away from a point scoring position. Philp now holds ninth position in the rider standings on 53 points. The next round is at Brands Hatch on the full circuit over the weekend of July 20-22, when both riders will be seeking some top results to retain their top-10 positions in their respective championships.